by Brent, MBA,, Carolyn A. Everything you need to know to ensure that your elderly loved one is being properly cared for. 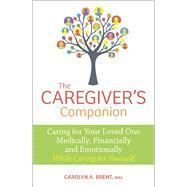 Brent leaves no stone unturned, provides personal stories and scenarios for context, and includes other references and resources in this complete guide to caregiving.